Emily Infeld will run in the 10,000-meter Olympic race on Friday morning, Aug. 12. Cleveland Heights's Beaumont School will host a watch party on Friday, Aug. 12, at 9:30 a.m., to cheer on runner Emily Infeld, a 2008 Beaumont graduate, as she competes in the 10,000-meter event in the 2016 Olympics. 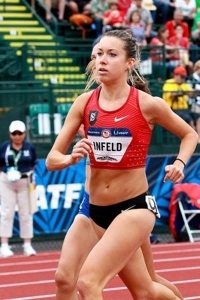 The race is scheduled to start at 10:10 a.m.
Infeld, the daughter of University Heights Mayor Susan Infeld, came in second in the 10,000-meter qualifier on July 10, and is representing the United States in Rio de Janiero. A distance runner, Infeld is best known for winning the 10,000-meter bronze medal at the 2015 IAAF World Championships. Infeld graduated from Georgetown University in 2012; while at Georgetown, she was the 2012 NCAA indoor 3,000-meter champion. Infeld's personal bests include 15:07.18 for 5,000 meters and 31:38.71 for 10,000 meters—both set early in the 2015 outdoor season. Community members are invited to join Beaumont students, faculty, staff, parents and friends of the school for the live watch party, which will be held in the school's dining hall. Jim Emery, Beaumont's longtime cross country and track and field coach, will host the event and provide commentary. Beaumont School is located at 3301 North Park Blvd. Rick Haase is Beaumont School's director of public relations and marketing.